She nodded. 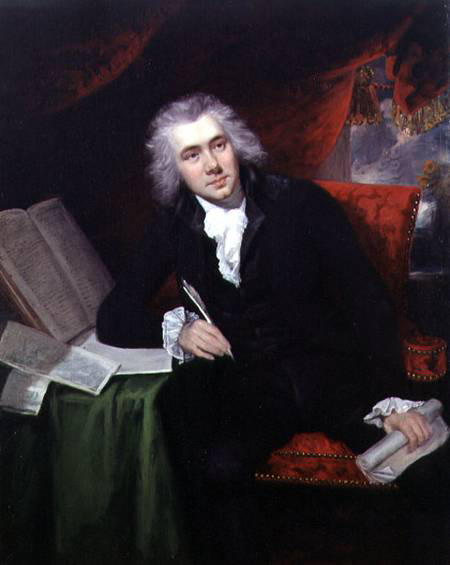 Wilberforce was the leading voice for abolition of the slave trade in England. Some slaves called him King Wilberforce. Never mind him; the slave trade still went on. Wilberforce agreed to take on abolition as his cause, "provided that no person more proper could be found." In 1791, after a very long Parliamentary committee hearing on the slave trade--Wilberforce introduced his first abolition bill in Parliament. It was defeated. He kept on introducing bill after bill, but as the 1790s wore on and France's Revolution frightened the Establishment, the discussion on slavery and the slave trade lessened. Parliament began to concentrate on containing the malcontents in England and once England and France were at war, the government turned its attention to that. So, 1799, the year Pearl opens, was a dead year for the abolition movement. The Abolition of the Slave Trade Act was passed in 1807, abolishing the Atlantic slave trade (though not slavery itself). Slavery in the British Empire was officially abolished in 1833. Wilberforce died three days after this act was passed. The movie Amazing Grace starring Ioan Gruffudd and Benedict Cumberbatch depicts the British abolition fight, focusing particularly on Wilberforce. 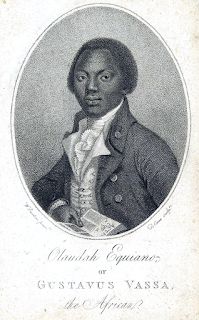 Olaudah Equiano was an African-born freed slave who lived in England. Kidnapped as a teen and taken into slavery, Equiano was transported across the Middle Passage to Barbados, then sold to a British Royal Navy officer, who changed his name to Gustavus Vassa. Equiano was taken to Britain and also fought alongside the other men on the naval ships that his master fought on. Equiano was educated in Britain, became a Christian, and then was sold to another man who allowed Equiano to earn his freedom. He worked as a merchant in West Indies, but found it too dangerous (he was almost kidnapped back into slavery) and so, decided to settle in England. He became involved in the abolition movement of the 1780s, his experiences aiding the cause. In 1789, he published The Interesting Narrative of the Life of Olaudah Equiano, or Gustavus Vassa, the African, which went through nine editions in his lifetime. He gave lectures and became a leading figure of the black English community. He married an Englishwoman, Susannah Cullen, in 1792 and they had two daughters. Olaudah Equiano died in 1797, but I imagine his name would've been known among slaves in an English colony. “They freed you?” Pearl asked. William Murray, 1st Earl of Mansfield, was the Lord Chief Justice of England from 1756 to 1788. During this time, Mansfield gave his most famous ruling in 1772 in Somerset's Case. He was also raising his young biracial great-niece Dido Belle. Somerset's Case, to summarize, involved James Somerset, a slave brought to England by his American master Charles Stuart, in 1769. Somerset tried to escape. Upon recapture, he was taken onto a ship bound for Jamaica, where Stuart intended to sell him. However, people claiming to know Somerset filed for habeus corpus and the case was turned over to the court to determine if the imprisonment was legal. The case got a lot of attention. Pro-abolitionists donated money to fund Somerset's side. The argument put forth was: while the colonies might have slavery, England itself did not have common law or an act passed by Parliament specifically recognizing slavery (in England)--therefore, slavery was illegal (in England). Plus, English contract law did not allow a person to enslave themselves. The other side argued that slave sale contracts were recognized, so surely slavery was a thing in English law. The state of slavery is of such a nature, that it is incapable of being introduced on any reasons, moral or political; but only positive law, which preserves its force long after the reasons, occasion, and time itself from whence it was created, is erased from memory: it's so odious, that nothing can be suffered to support it, but positive law. Whatever inconveniences, therefore, may follow from a decision, I cannot say this case is allowed or approved by the law of England; and therefore the black must be discharged. In other words, a slave could not be forcibly taken away from England. Moreover, the case also ruled that slavery was illegal in England and Wales. However, the slave trade still went on and frankly, so did slavery in England, though most people seemed to take the Somerset Case as saying that slaves couldn't exist in England. Hence, although Pearl and her new friends are free (and some say Lord Mansfield freed them), there were still slaves in cities like Bristol, which had been a huge slave port. Mansfield also ruled in the Zong case, though there, unlike what the movie Belle depicts, it wasn't about the loss of humans lives so much as insurance fraud. Thomas Clarkson isn't mentioned in Pearl, but he was a very important figure in the British abolition movement. If Wilberforce was the Parliamentary representative, Clarkson was the workhorse. He was a divinity student at Cambridge when he entered a Latin essay competition. The topic was "Is it lawful to enslave the unconsenting?" In the course of his research for this essay, Clarkson grew appalled by slavery. He won the competition. On a horseback journey from Cambridge to London, Clarkson had a "revelation" near Ware, Hertfordshire. He later wrote that "If the contents of the essay were true, it was time some person should see these calamities to their end." He then translated the essay into English and published it in pamphlet form. Through that, he was introduced to other abolitionists and Clarkson helped found the Society for the Abolition of the Slave Trade in 1787. He went everywhere collecting evidence and interviewing people about the horrors of the slave trade so that he could then bring all this back to Wilberforce to use as he brought up proposal after proposal in Parliament. Clarkson was almost killed in Liverpool, gave speeches across the country, obtained equipment like thumb screws and chains used on slaves, gathered petitions, and continued to write against slavery. His works are available at Project Gutenberg. He lay low during the French Revolution years, but in 1804, he and his fellow abolitionists, feeling that the war with France would soon be over, started up again. In 1807, the slave trade (though not exactly slavery itself) was outlawed. 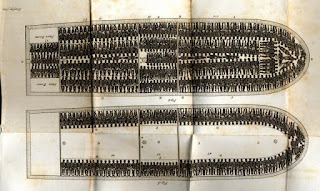 That slave ship, however, is not! It's disgusting that people suffered through such a journey. Well, all of this stuff was accumulated over several years. I saw Amazing Grace, then I wanted to read a little more on the British abolitionists. And to be honest, Pearl is pretty history light. Some of the novels I read are extremely detailed and deal heavily with actual historical figures and events. I...am not there yet. I liked the actress they cast for Belle and I'm glad they made it because seriously--there were mixed people back then--but I was kind of underwhelmed by parts of it, especially the dialogue, which got very "As you know, Bob" at times. Let me know what you think.